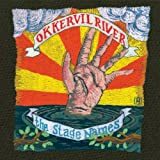 Another lean summer week for music releases brings one of my most anticipated discs of 2007, Okkervil River's The Stage Names, an album sure to find its way to many year-end lists (my own included). Grace Potter & the Nocturnals release their sophomore effort, This Is Somewhere. The Magnolia Electric Co. box set of three brand new albums, Sojourner, is a must-have for any fan of Jason Molina. Notable reissues are the Dickies' Second Coming (remastered with bonus tracks) and Jennifer Warnes' Leonard Cohen tribute, Famous Blue Raincoat.